Following Philip Davies MP’s presentation at ICMI-16, Baroness Corston has challenged the accuracy of his claims in an article in The Guardian. Philip Davies presented the case that men are treated more harshly in respect of prison sentencing than women. I have dealt with this topic previously (and here) and come to the same conclusion as Philip Davies. I will not repeat the case here but confine myself to responding to Baroness Corston’s counter-claims. 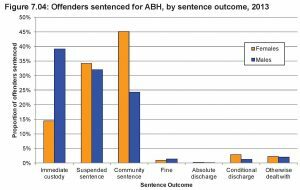 I will principally deploy data from the Ministry of Justice Sentencing Statistics 2009 Supplementary Tables (Ref.1) and the Ministry of Justice Statistics on Women and the Criminal Justice System 2013 (Ref.2). The reader may easily check what follows for himself. The Guardian quotes Davies as claiming that, in 2009, 34.7% of men were sentenced to immediate custody for violence against the person, compared with 16.9% of women, and in the same year 61.7% of men were sentenced to immediate custody for robbery, compared with 37.7% of women. I can confirm that these figures are correct. They can be found in Ref.1 Table 2i. In the Guardian article, Baroness Corston attempts to refute this evidence of harsher treatment of men by the observation, “In the same year, however, women were sentenced to an average of 17.9 months in prison for violence against the person, compared with 17.7 months for men“. I can confirm that these figures also are correct. They appear in Ref.1 Table 2j. However, what the Baroness did not draw attention to is how unrepresentative this one data point is of the totality of data in that same Table. I have rendered the data of Ref.1 Table 2j graphically in Figure 1, below. 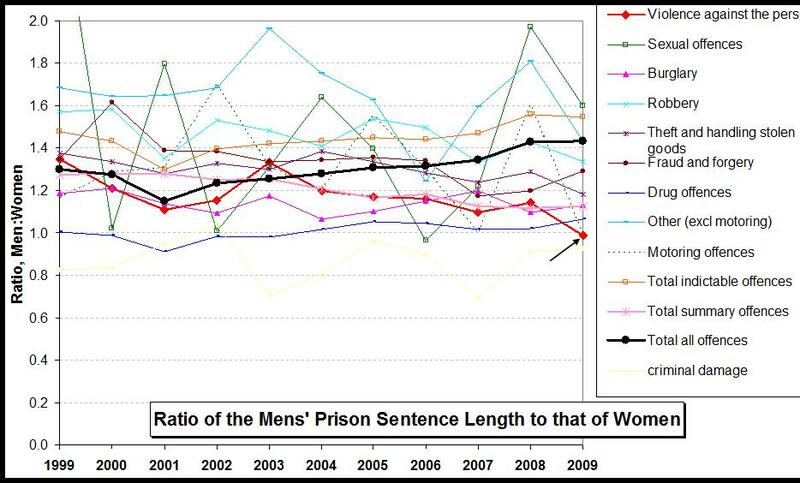 For this purpose I have taken the ratio of the average sentence length awarded to men to the average sentence length awarded to women for the same offence category (where the averaging is carried out only over those actually sentenced to prison, i.e., a substantially higher proportion of men). The data point identified by the Baroness, at a ratio of 0.99 and hence uncharacteristically less than 1, is indicated by the arrow on the Figure. 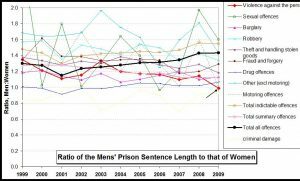 It is clearly preposterous to claim that this single data point invalidates Philip Davies’s claim that men receive longer prison sentences on average. On the contrary, the data support this contention. More worryingly, since the Baroness has clearly looked up this Table of data, how could she have missed observing that the bulk of the data support Davies’s contention? 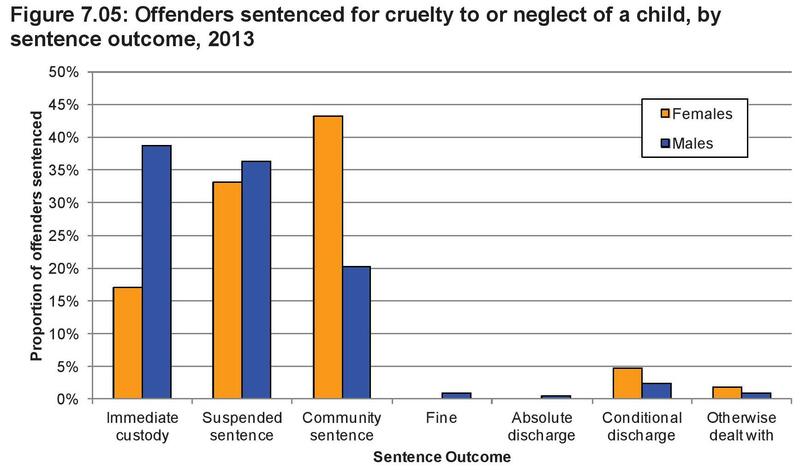 Other figures quoted in the Guardian article from Davies’s speech were that, in 2014, 33% of men were sentenced to custody for child neglect, compared with only 15% of women. I can again confirm that these figures appear to be correct, in that the data for 2013 are essentially the same – as shown by Ref.2 Figure 7.05, reproduced below as Figure 2. 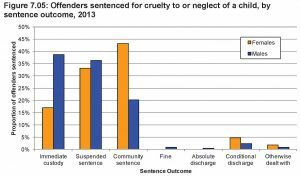 Whilst men who are convicted are more than twice as likely to be sent to prison for cruelty to, or neglect of, a child, women are more than twice as likely to receive a community sentence. This is consistent with Davies’s contention. In the Guardian article, Baroness Corston also claimed that “Generally a lot of the crimes women commit are associated with poverty; shoplifting for food for the children is not uncommon”. 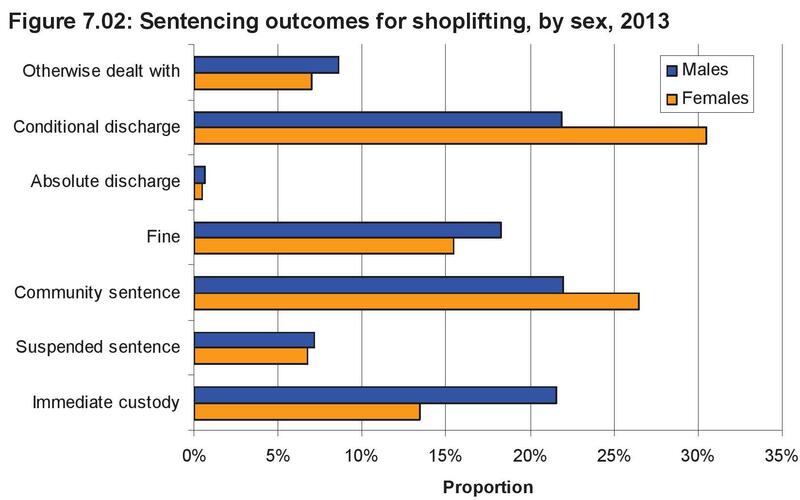 I have no data on what proportion of shoplifting is for food – or indeed for food for children. I would be interested to see the Baroness’s source for these claims. The remark appears to be an appeal to sentiment. In terms of data, Ref.2 Figure 7.02 is reproduced as Figure 3 below. 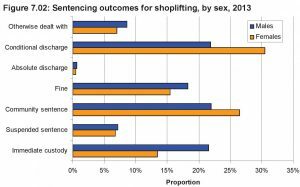 It shows that whilst women are more likely than men to receive a community sentence or a conditional discharge for shoplifting, men are more likely than women to go to prison for shoplifting. This is consistent with Philip Davies’s claims. Baroness Corston attempts to refute Davies’s contention of harsher treatment of men by the observation “I’ll give you an example: a woman who was sentenced to life for a first offence of wounding with intent. That would never, never happen to a man.” This must be ruled invalid as evidence. A single case has no bearing on the overall picture. I could cite dozens of cases of women committing acts of violence which did not result in a prison sentence. But even 100 selected cases prove nothing about the trend – for this one needs data. The statistical picture is provided by Figure 4 – taken from Ref.2, Figure 7.04. 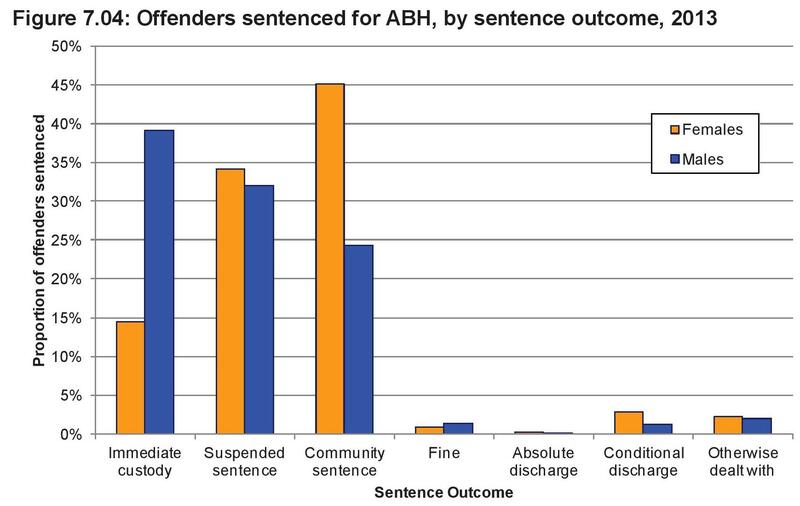 It shows that men convicted of actual bodily harm (ABH) are more than twice as likely to go to prison as women, whilst women are nearly twice as likely to receive a community sentence. The number of men in prison increases relentlessly despite the crime rate falling for twenty years. Very strong lobbies and political will are backing more lenient treatment for women, whilst also pursuing a policy of being ‘tough on crime’. Thus, a gender disparity is being driven by policy. The fundamental issue relates to the meaning of “equality”. Philip Davies insists that he is concerned to promote equality, the present position being inequitable. But Philip Davies, like myself, believes that equality means treating everyone the same. This is the true source of the disagreement. For there is a very strong lobby, of which Baroness Corson is merely an exemplar, who believe that equality does not mean treating everyone the same. That is the underlying issue, and that is what the numerous newspaper articles on Davies’s speech should be exposing to public scrutiny – not selfies of young women eating cake. This entry was posted in justice on 14th August 2016 by William Collins.